Come and experience our state-of-the-art, 7th Generation VISIA® Complexion Analysis System. We’re all too familiar with how our faces look in the mirror but looking at your face with VISIA® is another story entirely. VISIA® is an imaging system that allows you to see details of your face and skin that are invisible to the human eye. VISIA® imaging is a simple process. You rest your chin on a small stand and the device takes several pictures of your skin, using regular, cross-polarized, and UV light. The photos show you the status of your skin surface, plus the underlying dermis, which is the supporting layer below the surface. You’ll receive a complete analysis of your skin, including pigmentation, sun spots, pore size, wrinkles, texture, blood vessels, and bacteria). The analytical algorithms within the device will give you a comparison of your skin to the general population who match your age and skin characteristics. It is quite remarkable. At Impressions MedSpa, our passion is good skin health and rejuvenation. The VISIA® Imaging Complexion Analysis is the first step in understanding your skin’s condition so that you can make intelligent and informed decisions about how you should focus your future efforts to maintain and improve your skin health. 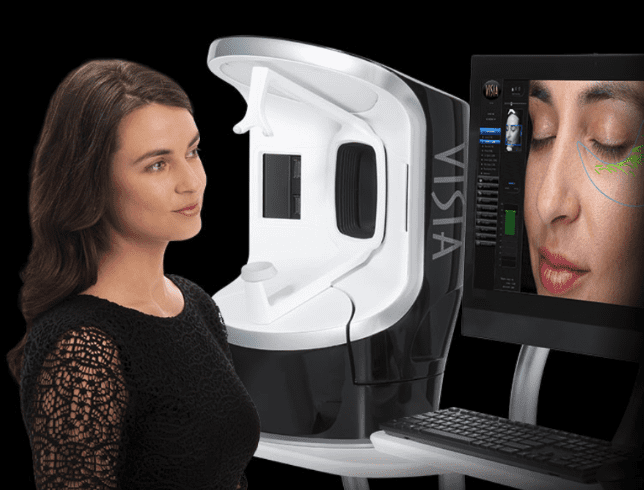 Click the “Book Online” button now to schedule your VISIA® facial analysis scan. You will be glad you did.